Estimation of indigestible neutral detergent fibre (iNDF) is necessary for accurate and precise predictions of feed energy values and potential microbial protein from digested NDF in the rumen. Due to lengthy laboratory procedures, iNDF has been estimated using the formula ADLx2.4 (iNDF2.4). The relationship between iNDF and acid detergent lignin (ADL) is more variable, across and within forage species. The purpose of our study was then to assess the variability of iNDF and respective implications on ration fine-tuning for dairy cattle. Sixty forages, including grasses, maize silages and lucerne hays, were fermented in vitro from 0 to 240 hours. Residual NDF of the fermented samples were obtained at 0, 6, 12, 24, 36, 48, 72, 96, 120, 144, 216 and 240 h, with the last value assumed to represent iNDF ( iNDF240).This was used to obtain the potentially digestible NDF fraction (pdNDF). Rates of digestion of pdNDF were obtained assuming a first order decay. Simulations with the Cornell Net Carbohydrate and Protein System (CNCPS v 6.1, 2012) were done to evaluate the effects of the different estimated iNDF and NDF rate of digestion (kd) on energy and microbial protein estimations, assuming the requirements of a high-yielding lactating cow and a standard TMR with at least 50% forage. Results were dependent on the amount of forage and respective NDF and ADL. The iNDF240 values resulted between 1% and 136% higher than the iNDF2.4 values. The reduced pdNDF pool resulted in both lower cell wall linked protein in the rumen and microbial protein of around 5 to 165 g, and, as a consequence, on a total decreased metabolizable protein for milk. Use of iNDF240 showed consistently lower metabolizable energy (ME) between 2 and 10 MJ/day, compared to when using iNDF2.4. The improved metabolizable protein (MP) and ME values would result in 0.3 to 3.2 kg/d less milk when using iNDF2.4. This research demonstrates how points later in the fermentation curve, even if not biologically relevant for the cow, result in a more accurate and precise estimation of the rate of NDF digestibility. Indigestible NDF estimated at 240 h would give better predictions of rumen parameters in models like the CNCPS and better fine-tuning in dairy cow diets, especially when using high forage and/or NDF rations. Keywords: CNCPS, in vitro digestibility, ADL, metabolizable energy, metabolizable protein. Neutral detergent fibre (NDF) is characterized by the presence of a fraction that is unavailable for microbial digestion in ruminants (i.e. indigestible NDF = iNDF). Estimation of iNDF is necessary for accurate and precise predictions of energy values and microbial protein synthesis from digested NDF in the rumen. The digestibility of the remaining fibre, the potentially digestible NDF (pdNDF = NDF - iNDF), determines the availability of NDF. Forage digestibility is thus constrained by iNDF and the rate of digestion of pdNDF (Van Soest, 1994). Furthermore, iNDF has been characterized as the most important factor affecting the digestibility of the total diet organic matter (OM) (Nousiainen et al., 2004). According to Ellis et al. (1994) determination of iNDF should be included in all basic feedstuff analysis because it has a predictable digestibility, can be used for the estimation of the pdNDF, and has an important role in contributing to the rumen digesta load. Lignin is generally accepted as the primary entity responsible for limiting the digestion of forages (Besle et al., 1994; Van Soest, 1994). Due to lengthy laboratory procedures, iNDF has been estimated using the formula ADLx2.4 (iNDF2.4) (Chandler et al., 1980) in rationing software like the CNCPS. The same formula is applied in empirical estimation of the NDF rate of digestion for forages, when only one or two time points of the fermentation curve are available (Van Amburgh et al., 2003). It has recently been shown (Raffrenato et al., 2009) that increased recovery of both ADL and iNDF alters the relationship between iNDF and ADL, not only across forage species but also within species. The hypothesis is that using the 2.4 value, as proposed by Chandler et al. (1980), will in most cases under or over-estimate the iNDF, resulting in biased microbial protein or energy deriving from forage NDF, when using software like the CNCPS. The objective of the study was therefore to assess the variability of iNDF in several groups of forages and the implications on the resulting feed energy and potential microbial protein synthesis from diets using three of these forages compared to the true iNDF values in the calculations. where: NDFt = concentration of residual NDF after t hours of fermentation when t > L and NDFt = pdNDF + iNDF when t < L; pdNDF = concentration of potentially digestible NDF; kd = fractional rate of pdNDF digestion; L = discrete lag time; iNDF = concentration of indigestible NDF. Values obtained from the decay model in SAS were analysed for variability and the Student's t-distribution was used to test the differences between the iNDF's and kd's of the two estimations. Evaluations were done within each forage group and thus using each group's degree of freedom. A simulation with the CNCPS (v 6.1, 2012) was performed to evaluate the effects of the different estimated iNDF (iNDF2.4 vs. iNDF240) and relative kd (kd2.4 vs. kd240) on energy and microbial protein estimations and allowable metabolizable energy (ME) and metabolizable protein (MP) milk yields, assuming a high yielding lactating cow and a standard TMR with at least 50% forage. Specifically, information on a third lactation-dairy cow weighing 650 kg (maturity assumed), producing 40 kg of milk per day (3.5% fat and 3.3% protein) was used in the simulation. Two forages, maize silage and lucerne hay from the samples analysed, were chosen, based on their iNDF's and kd's as being the closest to the average values of the groups of forages used. A diet was then formulated based on common ingredients used in South African dairy rations. Predicted values of iNDF obtained using the non-linear procedure (iNDF240) were higher than the iNDF obtained using the 2.4 formula (iNDF2.4; P <0.01; Figure 1, Table 1), across all forage groups. The iNDF240 values were between 1% and 136% higher than the iNDF2.4 values, confirming previous findings (Raffrenato et al., 2009; Raffrenato & Van Amburgh, 2010). Some of the forages reached the iNDF before 240 h (e.g. lucerne hays at 120 h), but to maintain consistency only 240 h will be represented as an optimal time point in the present study. The larger iNDF240 resulted in ratios between iNDF and ADL across forage groups higher than 2.4 (P <0.01). Among the forage groups, only part of the lucerne samples resulted in ratios iNDF/ADL numerically lower than 2.4 (Figures 1 and 2). Furthermore, the residual NDF after 240 h of fermentation were highly correlated (r = 0.97; P <0.01) to the iNDF values predicted by the non-linear SAS procedure. The decay model resulted in kd's larger (kd240; P <0.05) than the values obtained using the formula by Van Amburgh et al. 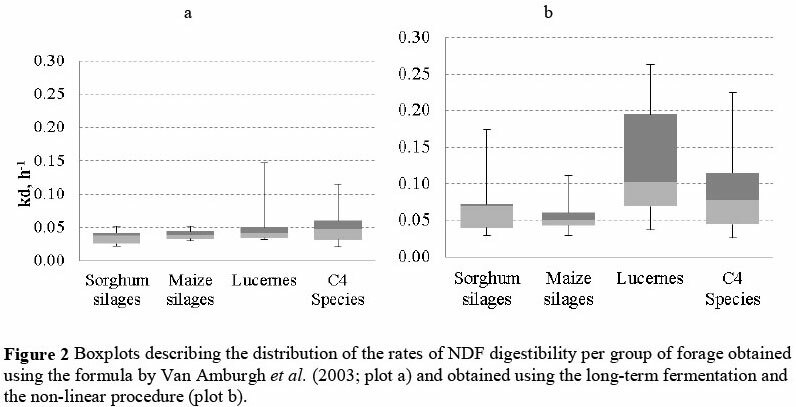 (2003; kd2.4), across all forage groups, because of decreased pdNDF pool size (P <0.01). Figure 2 shows the distributions of kd2.4 and kd240. The higher variability of rates of digestion across all forage groups becomes apparent. Standard deviations within forage groups increased (P <0.01) for both iNDF240 and kd240, when compared to, respectively, iNDF2.4 and kd2.4. To evaluate the effects of the different estimated iNDF (iNDF2.4 vs. iNDF240) and relative kd (kd2.4 vs. kd240) using CNCPS, amounts of ingredients for the simulation were first optimized to satisfy the simulated animal requirements according to the kd2.4. Priority was given to minimum requirements of dry matter intake (DMI), ME and MP, and trying to reach the minimum value of peNDF of 21% and microbial protein (MCP) of 50% of total MP. Values of iNDF and kd of the two forages, initially based on ADL>2.4, were then replaced by the ones obtained with the non-linear procedure, keeping the amounts of forages constant. 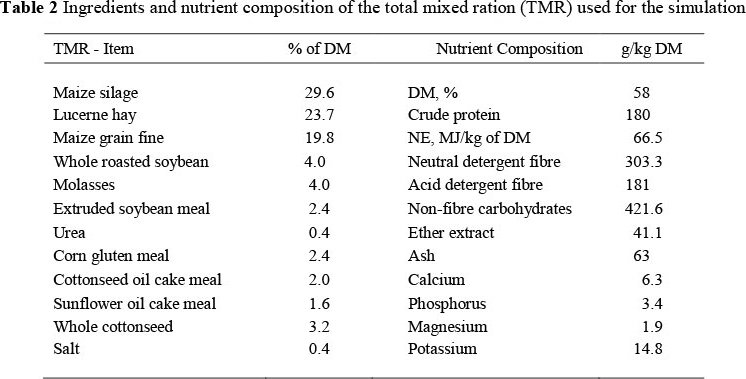 The diet is shown in Table 2. Values of both iNDF and kd for maize silage and lucerne hay were then changed to the updated ones (iNDF240 and kd240) with amounts kept constant. Both ME and MP requirements decreased from 101% to 95% and 97% for ME and MP, respectively, allowing 37 kg of milk, instead of 41 kg (10% reduction). A detailed analysis of the CNCPS pools size shows a decreased pdNDF degraded from 1990.4 g/d to 1582.2 g/d (20% reduction), resulting in 5% less acetate production in the rumen. This would also result in a decreased NEL from 6.65 to 6.19 MJ/kg DM. Metabolizable protein was only affected by the microbial component with a reduction of 30 g/d of MP from 69 g of reduced bacteria from pdNDF. Effects of underestimating iNDF when formulating rations would clearly be dependent on the amount of forage and respective NDF and ADL and quality of forages. When using other maize silages and lucerne hays from the samples analysed, the reduced pdNDF pool resulted in both lower cell wall linked protein in the rumen and microbial protein of around 5 to 165 g, and, as a consequence, on a total decreased MP for milk. Use of iNDF240 showed consistent lower ME between 2 and 10 MJ/day. The iNDF240 and kd240values would result in ME and MP allowing 0.3 to 6.2 kg/d less milk than when using iNDF2.4. 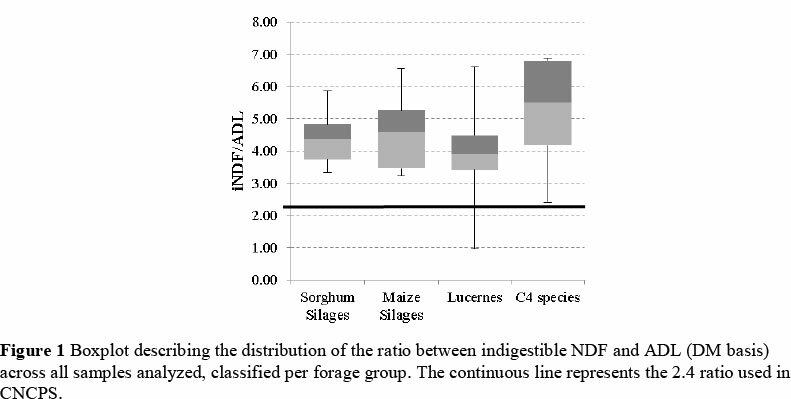 The variability assessed of iNDF across and within forage groups clearly shows that the relationship between ADL and NDF is not static and it provides a new perspective on the concept of iNDF as published by Chandler et al. (1980). Therefore, points later in the fermentation curve, even though not biologically relevant for the cow, result in a more accurate and precise estimation of the rate of NDF digestibility, from a more correct estimation of the potentially digestible NDF. This allows for better estimate rumen parameters used in models like the CNCPS and better fine-tuning in dairy cow diets, especially when using high forage and/or NDF rations. Simulation results in fact show how the use of a true iNDF can impact the availability and subsequent feeding value of NDF and demonstrate profound effects of these parameters on the supply of energy and microbial protein.